The Kota Kinabalu City Mosque, officially called Masjid Bandaraya Kota Kinabalu, is the main mosque of the city of Kota Kinabalu and is one of the most recognizable landmarks of the city. It was built in year 2000 in celebration of the cityhood of Kota Kinabalu. Being the main landmark of Kota Kinabalu, the mosque is popular among tourists. When visiting the mosque, be mindful about your clothing. The general rule is to wear clothing that covers the whole legs and the arms. The mosque is open to all Muslim and non-Muslim visitors except during hours of prayers. TRIVIA: The Kota Kinabalu City Mosque was designed by a Filipino named Jerry Larita, and during its construction, many of the workers who built the mosque were also Filipinos. 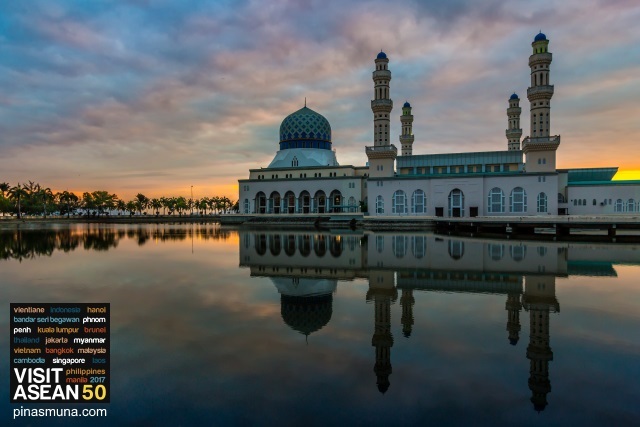 The Kota Kinabalu City Mosque is not to be confused with the Sabah State Mosque (Masjid Negeri Sabah) which is also located in Kota Kinabalu and is the main mosque of the whole state of Sabah. Kota Kinabalu City Mosque is located at the corner of Jalan Tun Fuad Stephen and Jalan Pasir, some 8 kilometers from the city center. The easiest way to get to the mosque is by taking a Grab car. Fare is around MYR 8.00 (~PHP 100.00/~US$ 2.00). You can download the Grab application here.